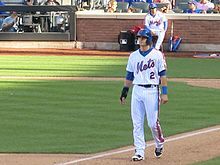 Gavin Glenn Christopher Joseph Cecchini  (/ˈɡeɪvən tʃɪˈkiːni/; born December 22, 1993) is an American professional baseball second baseman in the New York Mets organization. Cecchini was born in Lake Charles, Louisiana, and attended Alfred M. Barbe High School. Prior to the 2012 MLB draft, Cecchini was regarded by Perfect Game as "good athlete, highest level hitter and outstanding middle infield tools." Cecchini initially committed to play college baseball for the LSU Tigers, before switching his commitment to Ole Miss. He was drafted by the Mets in the first round of the 2012 MLB Draft with the 12th overall pick. Cecchini began his professional career in 2012 with the Kingsport Mets of the Appalachian League, batting .246/.311/.330, and then was promoted to Brooklyn Cyclones for five games in which he was hitless to end the season. Baseball America ranked him as the #2 prospect in the Mets system and the Appalachian League's #12 prospect following the 2012 season. He began the 2014 baseball season as a member of the Savannah Sand Gnats of the Class A South Atlantic League, and for three teams in aggregate he batted .247/.328/.378. He was promoted to the Major Leagues on September 6, 2016. He made his Major League debut on September 11, striking out in a pinch hit appearance at Turner Field. On September 24, he hit his first career hit, an RBI double. For the season, he batted .208/.253/.273. Cecchini was designated for assignment on January 28, 2019 following the signing of Justin Wilson. He was outrighted on February 1, 2019 but was invited to spring training. He is the younger brother of Major League infielder Garin Cecchini. ^ "Gavin Cecchini". Baseball-Reference.com. Retrieved August 28, 2013. ^ "Gavin Cecchini Baseball Profile - Perfect Game USA". Retrieved October 19, 2014. ^ Parham, Chase (April 11, 2011). "Ole Miss lands elite shortstop". Rivals.com. Retrieved September 15, 2016. ^ "BaseballAmerica.com: Stats: Gavin Cecchini". Retrieved October 19, 2014. ^ "New York Mets at Atlanta Braves". USA Today. September 11, 2016. Retrieved September 15, 2016. ^ Todd, Jeff. "Mets Designate Gavin Cecchini, Announce Justin Wilson Signing". MLBTradeRumors. Retrieved January 29, 2019. ^ Kramer, Lindsay (February 2, 2019). "Mets infielder clears waivers, will be assigned to Syracuse". syracuse.com. Retrieved February 1, 2019. ^ Rosenthal, Seth (June 5, 2012). "Meet the Top Mets Draft Pick: Gavin Cecchini". New York. Retrieved August 28, 2013. "Mets prospect Gavin Cecchini follows brother's example". Newsday. Retrieved October 19, 2014. "Barbe's Gavin Cecchini selected as Louisiana's Mr. Baseball". The Times-Picayune. Retrieved October 19, 2014. "NY Mets prospect Gavin Cecchini donates $10,000 to Hurricane Sandy relief effort as tragedy hit home for Louisiana native". NY Daily News. Retrieved October 19, 2014. Wikimedia Commons has media related to Gavin Cecchini.